We wanted to circle back for an update on MBRX this morning, a stock that we signaled on June 21st, after noticing some abnormal activity the session prior. We’ll continue to stay hot on the trail of MBRX for as long as it continues to build higher base levels of support. 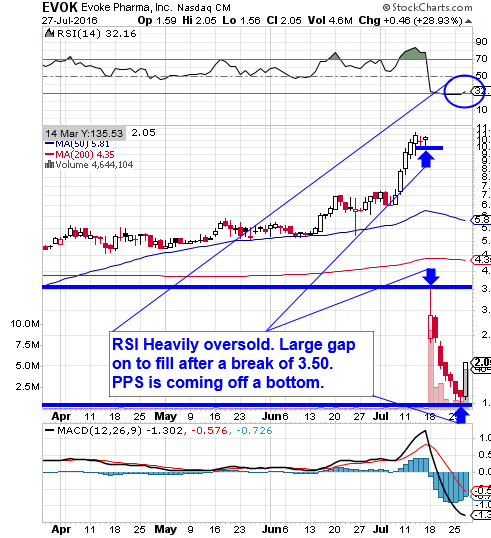 The day before the above-mentioned play, on June 20th, we highlighted SPEX after noticing the stock trading near a bottom, and it has been one heck of a ride since that time. We’ve seen this play run from a low of .9505 all the way up to 2.23. The bulk of that move came in yesterday’s session wherein the stock also traded massive volume, so we’ll be on the lookout for a possible momentum spillover as we head into week’s end. It was back on June 12th that we initially slated TROV for observation. The stock had been trending up off of recent relative lows since the beginning of this month. We’ve used the STZ optuions chain to our advantage in the past. The most recent occasion was last April, when we scored multibag gains with $155 Calls. The stock has been in serious growth-mode since then, and with a hearty, untraded-upon Q1 earnings beat this morning, we want to signal a range of contracts to watch once again. The stock is gapping up to the $200-range today, and we’re going to be waiting in the wings with the STZ 07/21 $190-210 Calls. We tagged MNKD a week ago today in our premarket report on May 4th, and wanted to circle back around this morning to go over the excellent performance the stock has recorded since then. At the time the stock had been looking like it wanted to rebound after crashing down to a bottom and our decision to mention it turned out to be timed perfectly. In each of the past five sessions MNKD has registered higher highs and higher lows, continuing to gain back ground that it had lost in previous weeks. From last Thursday’s low of .688, the stock has gone on to reach a high of 1.88, which represents an increase of 173% while volume over the same period has been impressive. The stock traded its highest volume since 2014 yesterday, so we’re really eager to continue tracking the activity in MNKD. Despite already showing us amazing single-session gains ranging from 380-3600% on Tuesday, which we recapped in yesterday’s premarket report, our options idea for the VRX chain, the Weekly $10.50-12 Calls saw even further advances once the session kicked off. We’ve included the total possible intraday gains from yesterday’s session, as well as the overall gains from our observed lows on Tuesday morning. Even though it’s not even close to our only percentage gainer in the thousands, this round of options calls with VRX is certainly going down as one of our most solid picks of the year so far. Even if someone had only bought shares in VRX stock itself, they could have been up just over 22% on this two-day swing. 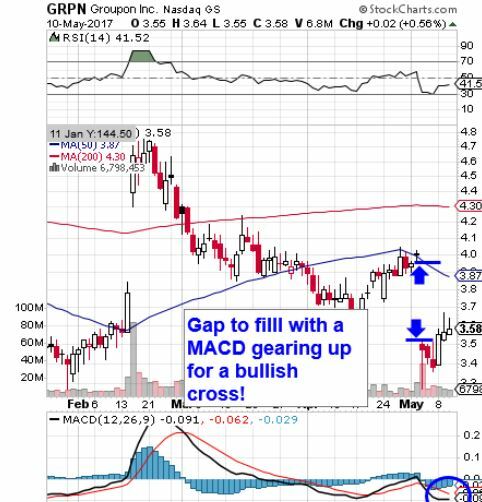 We want to place GRPN on recovery watch after noticing the stock coming up off a double-bottom, with a gap on the chart to fill to the upside, as you can see on the included snapshot. We like to monitor plays in this position, so we’ll put it on our radars in the days and weeks ahead. Given the look of this chart, we’d classify this as relatively low-risk, low-reward in comparison one of our average plays. We caught BTCS on a routine scan yesterday morning after noticing some abnormal activity from the session prior. Our timing ended up being extremely fortuitous, with the stock making quite an impressive morning run. From a low of .0013, it surged up as high as .0024 just prior to midday, for a healthy pop of 85% on almost ten times the three-month average volume. If BTCS can hold support at or above yesterday’s swing low, we’ll continue to be interested in the possibilities it may provide. EVOK is another fresh play that we’re taking a look at for the first time this morning. The stock has recently fallen off of a cliff, as we’ve pointed out on the annotated chart below. Beginning with a massive gap-down earlier this month, followed by several sessions of backsliding which culminated in a new 52-week low (1.52) being set on Monday. Yesterday’s bottom-bounce activity is what has us on alert. The stock is heavily oversold, and could be in line for a substantial rebound. We’ll want to be hanging around when that occurs, because even a return to the bottom of the chart gap at 3.50, from current levels, would spell an opportunity for significant gains. TPX is fresh off an earnings beat this morning which has it gapping up into the $70-range. We’re going to signal a range of longer-term options ideas for us to track in the days and weeks to come. Our area of interest here is going to be the TPX 08/19 $70-80 Calls, giving us just over three weeks’ time to see a continued PPS recovery.